Rochester, NY enters the ranks of other responsible communities actively planning for Climate Change like Portland, Oregon; Chicago, Illinois; Boston, Massachusetts; and Minneapolis, Minnesota. Rochester’s climate action efforts are not just part of an explosion of US states and cities stepping in to fill the leadership void on Climate Change since the Trump administration has turned a blind eye to this crisis. Our City has been working on its Climate Action Plan for quite a while beginning by tending to its own carbon footprint with the municipal operations Climate Action Plan in 2013. 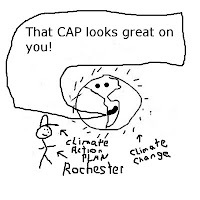 The CAP will eventually be included in Rochester’s Comprehensive Master Plan, whose purpose is “a means to promote and protect the general health, safety and welfare of the people and to lay out a course of action for the future social, physical and political development of the community”. There are many benefits for each community having a CAP and I talked about that in the beginning of 2016: Why Climate Action Plans (CAP) are so important for every community. The CAP starts out (as do all other community’s climate action plans) highlighting and emphasizing the science behind Climate Change. Then it describes “What Climate Change Means for Upstate New York”: Increasing temperature and changing precipitation patterns, impacts to the Great Lakes, reduced winter recreation, impacts to agriculture, and impacts to human health and equity. 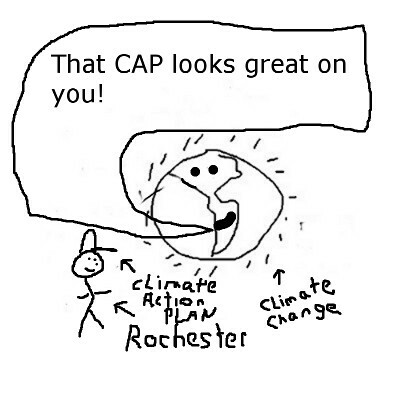 The CAP then proceeds to describe why Rochester needs a climate plan at all. The plan builds on a previous effort the City itself has initiated to reduce greenhouse gas emissions. With the development of this present CAP, the City widens its scope of the plan so that it’s part of a state and nationwide strategic plan to address Climate Change. Throughout this plan, area residents are reminded how addressing this crisis goes hand-in-hand with making Rochester a modern, thriving community. The plan focuses our view of local issues through the lens of Climate Change: The Local Waterfront Revitalization Program (LWRP), The Harbor Management Plan, Rochester Monroe Anti-Poverty Initiative, and the Transportation Improvement Program (TIP). By providing many benchmarks in population, greenhouse gas emissions, housing, energy use, and human health, our community will be able to measure our progress on these issues. This will allow Rochesterians to adjust our goals so that we are actually moving on a scale and timeframe that will matter. For Rochester, in particular, there is a real opportunity to thrive despite a warm and disruptive future (for a while anyway.) Every community everywhere is going to warm up but we in Rochester are not going to warm up as much or as quickly as many places around the world, including our southern cities. It’s not that Rochester and other rust belt cities are better prepared for Climate Change right now. It’s because our temperate location offers us an occasional respite from the heat. This is to say, we aren’t going to be nailed as hard and as soon with dangerous heat, water shortages, and sea level rise as many other cities in our country and around the world. Our hope is that the City’s CAP motivates Monroe County to work with Rochester and develop a more expansive plan. Sadly, Monroe County (where Rochester is only one community) is still languishing in Climate Silence. Soon, the City’s CAP must be integrated into a complete, national, and even international plan. Climate Change is a planetary crisis and needs to be addressed on that scale. This urgent need for national and global connectivity also highlights why it is so tragic that the US pulled out of the Paris Accord. Rochester’s CAP can do a lot. But it remains somewhat isolated and disjointed when it is not part of a planetary plan. It’s worse than sad that we now must continually push back against the present Trump administration’s anti-science, anti-environment, and anti-Climate Change agenda at a time when the window of opportunity is quickly closing.